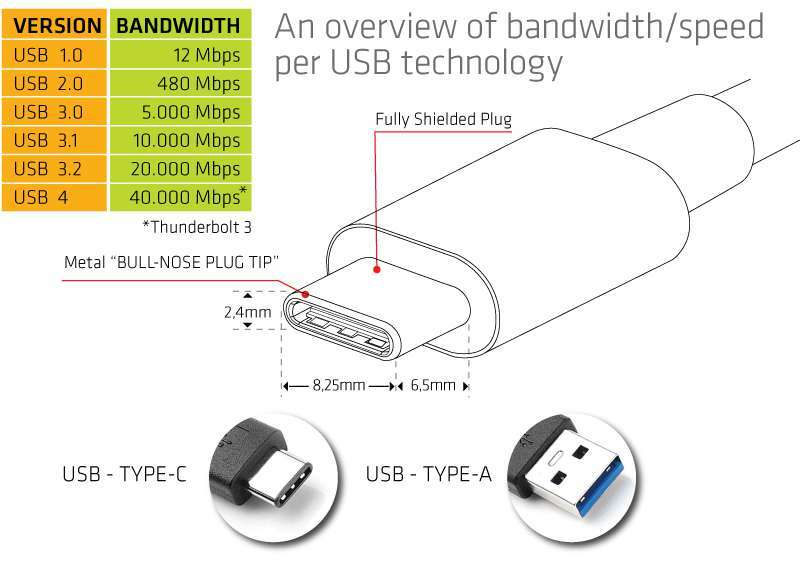 USB Type C is a specification for a reversible plug connector for USB Devices and Cabling. 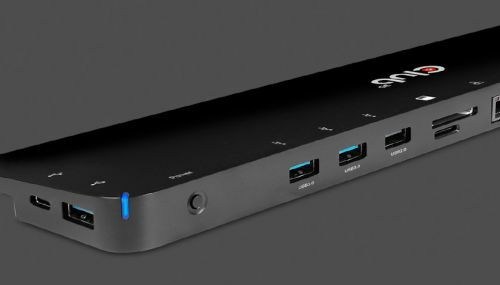 An important benefit of the USB Type C is that it supports USB 3.1, USB 3.0, USB 2.0 and Thunderbolt Technology. 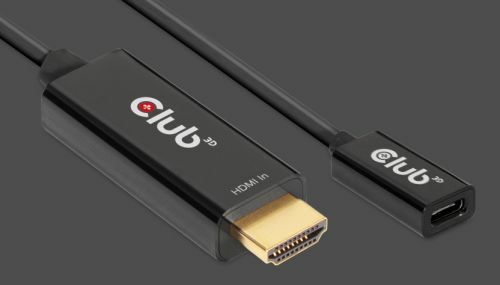 USB Type C ports can support a variety of different protocols using “AlternateModes”, which allows you to output Power, Data and Video Signals and use of adapters that can output HDMI, VGA, DisplayPort or other types of connections from that Single USB port. This allows for future devices to streamline their design to offer multiple output solutions through one singular output. Some external devices like for instance a computer Mouse will also need some power from the USB Port to operate. The Default Power that USB 1.0 and 2.0 can deliver is 2.5Watt (5Volt, 0.5A) and USB 3.0 and 3.1 can deliver 4.5Watt (5V, 0.9A). USB Power Delivery: “Power Delivery” works equally well with USB2.0 and 3.x. and it allows power draw up to 100 Watt from the source device. This power can be transferred at the same time the data is transmitted through the same cable. The intent is to permit uniformly charging for laptops, tablets, USB-powered disks and similarly higher power consumer electronics. 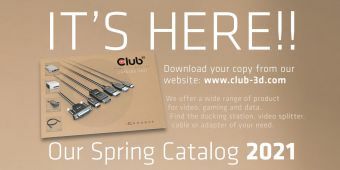 Please note that an Active USB Type C Cable with E-Marker Chip, like the Club3D CAC-1522, is recommended when making use of Power Delivery up to 100 Watt, to ensure a safe connection. “USB” stands for Universal Serial Bus and “3.1” is the recently released standard which indicates the technology and specifications it is compliant to. 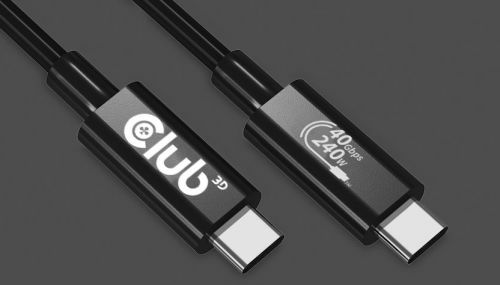 USB Type C is not the same as USB 3.1 – USB Type C is just a connector shape and the underlying technology could just be USB 2.0 , 3.1 or 3.0. Furthermore there are different USB Type-C 3.1 versions the “Gen1” and “Gen2”. Although Thunderbolt 3 is also coming out with a USB Type C connector, it is not the same as USB 3.1 Type C Gen2. USB Battery Charging technology ensures that one can safely charge mobile devices thru the particular USB Port with Battery Charging Feature support. Previously a USB Portable Device with a battery and charging capability simply took power from a USB port without any control. With “BC 1.2” introduced end 2010, a Portable Device can get more power and the battery can be charged faster. It is important to verify that a Portable Device complies with the BC 1.2 specifications while communicating with a Charging Downstream Port and identifying a Dedicated Charger, and ensuring that it continues to operate as a functional USB device. USB Graphic Technology allows you to connect almost any kind of display via a standard USB connector or cable. The technology is designed to be simple and easy to use: just install the software, plug in your device and within a few seconds you have got a new monitor, docking station or projector connected to your PC. 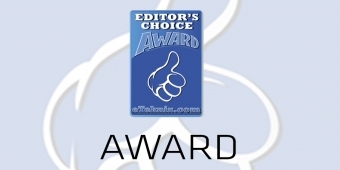 There is simply no easier way to add a display to your PC or Mac. 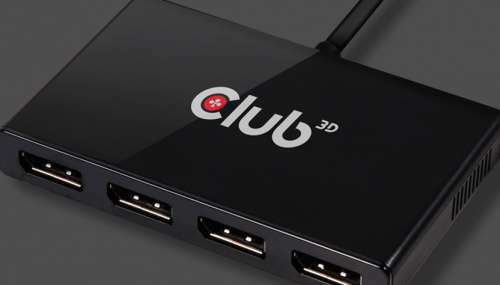 Club3D offers a wide range of products from universal USB docking Stations to USB Graphic adapters. USB Graphic offload all the heavy lifting of HD Video Playback and 3D Rendering to the GPU of your device. If your GPU performance is good you can even play games on a 4K Monitor. 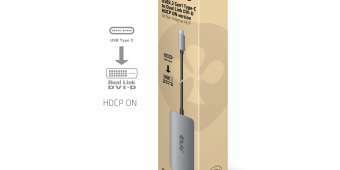 USB Graphic provide support for HDCP which means that you will not get a blank screen when trying to watch the latest HD Movie. 4K also known as Ultra High Definition (UHD) delivers four times as much details as 1080p Full HD, that is eight million pixels compared to two million pixels, bringing more image clarity, fine detail and greater texture. Now you can embrace these technologies with just a free USB Port.